Title: Robot Burp Head Smartypants! 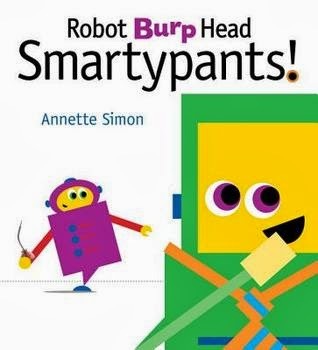 GoodReads Summary: Annette Simon’s rival robots are back with a new game of nutty and bolty — or is that burpy? — one-upmanship. Robot and Robot are thirsty. How about a big gulp of engine oil? Ga-lugg! Guzzle! Mmm, mmm — BurrRRRP! Oops! Pardon me! Of cour —Burrrrrp! — ourse! Oh, pardon me! On your mark, get set, belch! The green and purple robots from Robot Zombie Frankenstein! are back for a second round of "Top This" games! Burp to ten? Easy! Burp the alphabet? No sweat! Burp by tens while blindfolded, juggling, and skateboarding? Yikes! Reluctant readers won’t even notice that they’re learning as they laugh out loud at the wacky antics of these irreverent robotic pals. What I Think: I knew this book was going to be dangerous in my house because we have a total burp-on-command kiddo in residence here! I have no idea where he gets it from, but Peanut can burp up a storm and all you have to do is say go. Little Bean was so excited to name the letters and numbers on the inside cover. As he proudly pointed to each one, I mentioned to Peanut that there are some people who can burp the alphabet. His eyes lit up, "Really?" He was intrigued but I could tell he didn't really get it yet. It was one of those mom moments when I couldn't believe I was going to teach my kid how to burp the alphabet...but at the same time how could I not take the opportunity to teach my kid how to burp the alphabet? I don't know. As I type this I'm shaking my head at myself but it happened and it was fun and that's really all that matters. I talked him through trying to say the vowels while burping and then he tried all the letters. Some are definitely easier than others. He was amazed at this new talent! It made reading this book so much more fun and entertaining. As he burped through the pages for us, we were all giggling and our giggling turned into hysterics by the end. Both of my boys love books but I know not all boys love books like mine do. If I ever make a list of books to capture boys' attention, Robot Burp Head Smartypants! would definitely be on it. I would recommend reading this book ahead of time to familiarize yourself with what the story is about. A lot is going on with the dialogue between both of the robots that it's easy to miss how zany these two robots get as they try to outdo each other. The summary talks about how kids won't even realize they are practicing their counting or their alphabet and I completely agree with this. I can just imagine boy burpers lined up counting by tens. It makes me think of Ralph Fletcher. I saw him present on the topic of boy writers. He showed a sample of a group of boys who rewrote the 12 Days of Christmas compared to a group of girls who rewrote it. You can imagine the differences - especially when boys are allowed to be as creative as they want to be. Letting boys burp their numbers or their alphabet would be awesome. Obviously, you can always have a discussion about manners and point out how even the robots in the book excuse themselves. As a mentor text, this book would be a great idea starter for kids to think about writing their own stories about what they can do while they can count by tens. 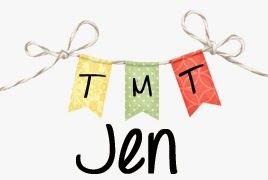 Kids might think about what talents they have and then write and illustrate a book to show what they can do. Taking photos or videos of kids counting by tens and editing them into a book or video would be fun to. Maybe kids can jump rope, hula hoop, hop on one foot, run backwards, do cartwheels and count by tens at the same time. This would be a fun activity that could also carry over to home where kids could get extra practice. Writing Prompts: Write your own story of counting by tens! Can you count by tens standing on one foot? While you cross the monkey bars? As you leap frog over your friends?